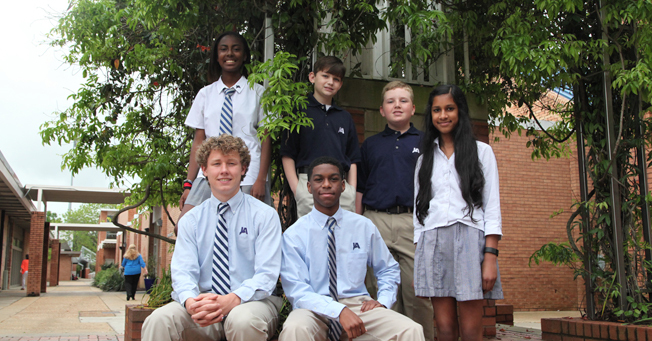 Jackson Academy has selected six students as Jernberg Scholars for the 2016-17 school year. The Jernberg Scholarship program, established by the JA Board of Trustees in 2014, celebrates and awards academic excellence and honors President Emeritus James Peter Jernberg Jr. who led Jackson Academy for 26 years. Chosen for the 2016-17 academic year are Boston Hollingsworth of Terry (fifth grade), Megan Lacey of Braxton (tenth grade), Parker Lowe of Brandon (seventh grade), Dolph Maxwell of Jackson (eleventh grade), Brandon Miller of Jackson (tenth grade), and Priya Ray of Flowood (eighth grade). Megan, Dolph, Brandon, and Priya are current JA students, and Boston and Parker will be coming to JA for the 2016-17 school year. In keeping with the influence Peter Jernberg has had on students and independent education in Mississippi and nationwide, the scholarships are designed to have a life-changing impact on the students receiving them. The students, likewise, will be individuals who will have an impact on the JA community through their focus on academics, character, and school participation. The 2016-17 Jernberg Scholars join those named for this current academic year, who are Gracie Coe of Brandon, (seventh grade), Carter Elliott of Brandon (eighth grade), Columbia Holeman of Morton/Sand Hill (ninth grade), Allie Perkins of Brandon (tenth grade), and Sahil Patel of Jackson (eleventh grade). This is the second year of the program. Qualified students may apply for the 2017-18 school year beginning September 15, 2016.